We’ve all heard the admonishment that you need to create art every day. But…life gets in the way. Jobs, family, gardening, etc. Sometimes I find all my have-t0′s overwhelming my urge to create. This weekend I just had to paint. Yesterday, before I could get overly involved in the rest of the home tasks, I trucked my painting gear out to the front yard and painted this flowerbed which has been calling me for weeks. It seems to be a symphony of purples, mauves, and yellows this time of year. The heat was oppressive. The humidity was drenching. But I had a great time. For you gardeners out there, you’re looking at purple cone flower, bee balm, weigela, daylilies, lambs ear, and a giant yucca. The flying pig is a bit difficult to make out but he’s one of my favorite yard statues, as he bounces on his spring in a strong breeze. Symbol of not-quite-lost causes. Then, this morning I decided to capture this weed, Giant Moth Mullen. It is already 5 feet tall and will probably top 6 or 7 feet. It has fuzzy leaves, similar to lambs ear and the most interesting curly-type leaves and stalk. It will eventually have a tall spike of yellow flowers which in turn, will produce seeds that the goldfinches love. Probably how it came to be growing near my cellar door. Majestic! 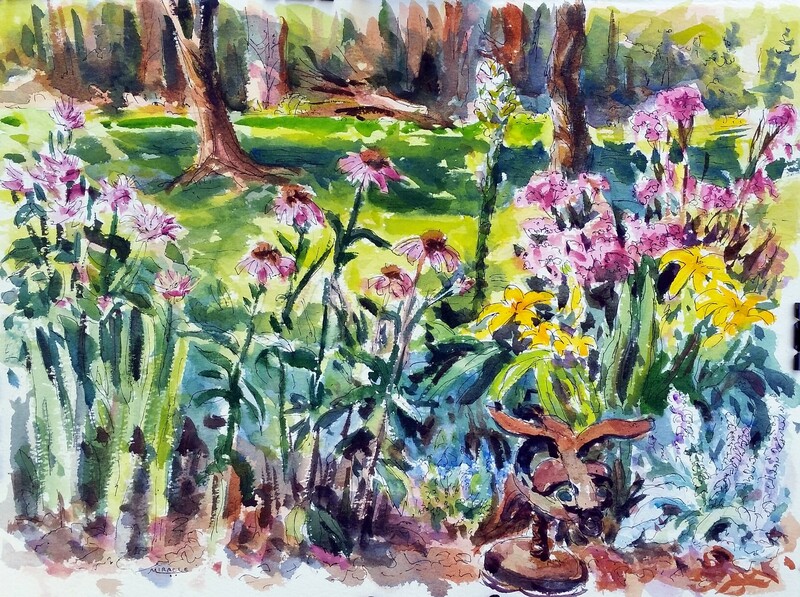 BTW, I was inspired by a blog challenge by James Gurney, who held a recent competition of people who paint weeds. This painting is not entered as it is past date, but I thought it was a perfect subject. 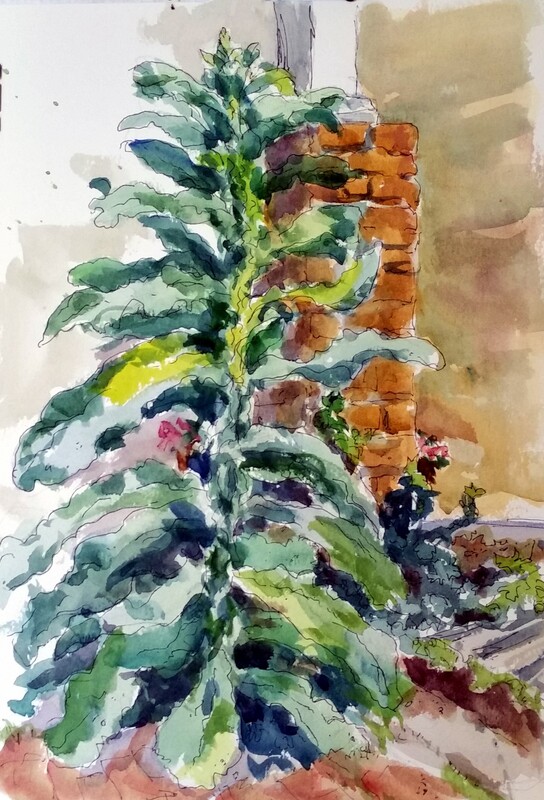 This entry was posted in art, country living, pen and ink, plein air painting, Uncategorized and tagged art, country living, gardening, kit miracle, painting, pen and ink, plein air. Bookmark the permalink.